Astronaut Catherine G. Coleman recently returned from 159 days of floating 200 miles above Earth, on board the International Space Station as Expedition 26 flight engineer. The nearly six-month expedition was the longest Coleman had ever spent in space, and she was accompanied by some unique cargo: an old Irish e-flat flute belonging to Matt Molloy of the Chieftains and a penny whistle belonging to the group’s front man, Paddy Moloney. Coleman’s grandfather, Joseph Fennessy, came from Ireland, and a love of Irish arts and traditions runs in her family: two of her nephews, the Murray Coleman brothers, are award-winning Irish dancers. Coleman herself finds joy in traditional Irish music. When she isn’t orbiting the Earth or preparing for an expedition, Coleman is an avid flautist and plays with a traditional music group. She met the Chieftains years ago, following a performance in Houston, and has kept in touch with them ever since. Coleman, who was born in South Carolina in 1960, is a graduate of MIT with a doctorate in polymer science and engineering from the University of Massachusetts. 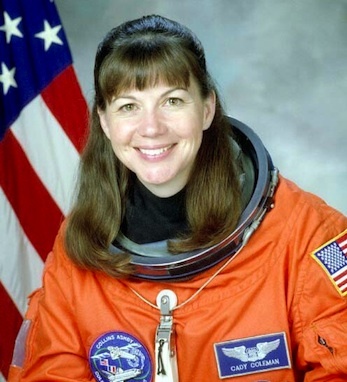 She was commissioned as 2nd lieutenant in the Air Force in 1983 and selected by NASA to join its Astronaut Corps in 1992. Coleman is married to glass artist Josh Simpson.